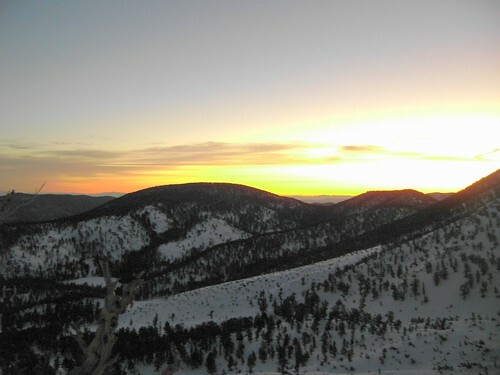 As soon as we got back in cell range from Baldy, we got a call from Arthur (DoogieMan) that he was already in Mentone. So we boogied back to the Mell-pad, upacked day packs, loaded up overnight packs, threw them in the Truck of Fun (TOF) and cruised the 210 on out to Redlands for dinner and hittin' the South Fork TH. We packed in about 4 miles or so and crashed for the night. I don't remember it being this cold when I snow camped last year, in fact it wasn't that cold when I snow camped last year. I shivered all night, and I have to figure out why. Workin' on it. Anyway, "all" we were doing on Saturday was moving camp up to the edge of the Big Draw, so around 11 a.m. (Piotrowski start!!) we loaded up and headed into the gulleys. Mike broke a lot of trail, I tried my hand at it a few times as well. The snow had a crust, then powder underneath, so snow shoes all the way. We made camp at the NW corner of the Big Draw, around 9800ft. We were up (grudgingly!) at 4 a.m. [well, Mike and I were up. Arthur's "alarm didn't go off" ] and hit it by 5:15 or so, climbing up to the north ridge of Jepson Peak. The snow was mostly firm and crusty, with a few powder spots, but Arthur cut some of the prettiest switchers I've ever seen, and we were on top of the ridge before the sun rose. 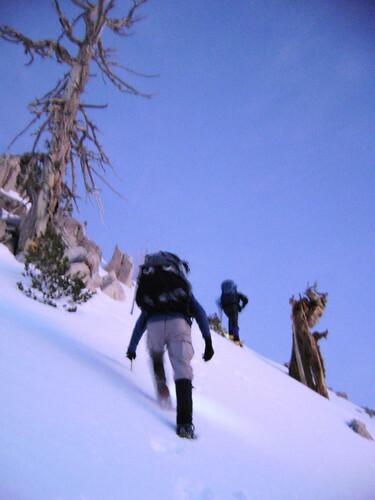 We had to resurrect the ancient art of tree wrestling a few times along the ridge, but the snow for the most part was really good, and we were able to stay on top for most of the route. I asked Arthur if he wanted a break, and then he let me lead! Woohoo! By 8 a.m. or so we were on the summit, and although a bit breezy, it was glorious! Wonderful views in all directions, and we could just barely make out the Southern Sierra in the distance. I was so happy to be over 11K again! 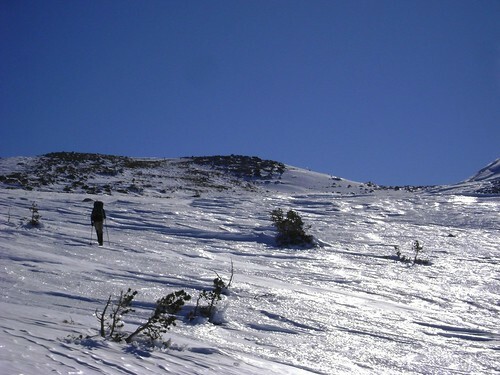 Following the ridge around to the east, we headed for Gorgonio. As we came down from Jepson, the wind died, and the sun warmed us up. The wind had carved beautiful crusts into the snow, and the patina of the reflecting sun was brilliant up there. 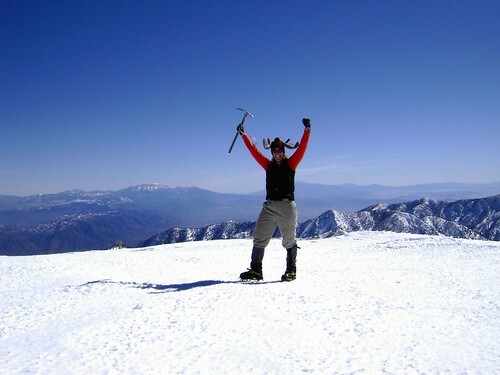 We summited Gorgonio, had lunch, then headed back down to the NW ridge of the Big Draw. 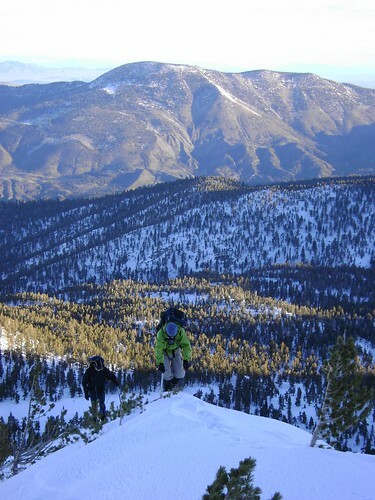 The original plan had been to drop into one of the chutes, find a clear spot, and glissade down into the bowl. Unfortunately, we overshot the good chutes, but when we walked down we found that the conditions were icey-dicey enough and it might've been an interesting glissade. We marched across the bowl back to camp, packed up, and cruised out. The powder snow in the gulleys allowed for some great snowshoe gliding on the descent! Last edited by MooseTracks on Tue Feb 12, 2008 10:55 am, edited 1 time in total. Slummin in So Cal - Climbing the big draw. 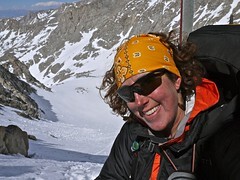 Laura - Thanks for the trip report and cool pictures. Nice horns! If this is "slummin", what do you have in mind when you're not slummin. Re: Slummin in So Cal - Climbing the big draw. Cy Kaicener wrote: If this is "slummin", what do you have in mind when you're not slummin. Cy -- don't get her started. She's busy turning into a Sierra Snob these days. Just be glad she comes down here at all. 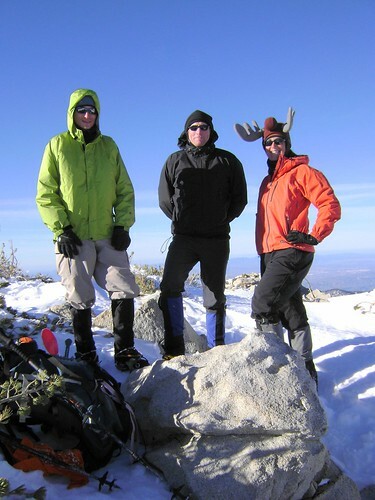 Nice report - It's hard to beat the local mountains in the winter. Every area has it's pluses and minuses - As much as I hate the congestion in Southern California, I do love the winter weather and the conveniences that come with urban/suburban living. As I'm getting older and my son is grown, I sure do like being fairly close to the airport so I can take off to see other beautiful areas with ease. Edit: Thanks for the edit. Last edited by KathyW on Tue Feb 12, 2008 5:37 pm, edited 1 time in total. Alan: I so miss you!! You and Eric should make plans to come up and play with me!! 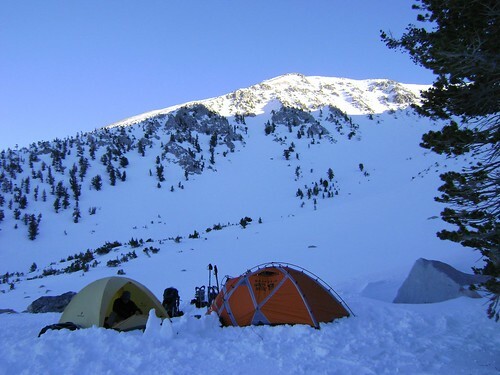 Is it really a problem where we camp when there's 4ft of snow everywhere? MooseTracks wrote: You and Eric should make plans to come up and play with me!! Anti-slumming in the Sierra? Sounds good, but you may have to wait out track season. 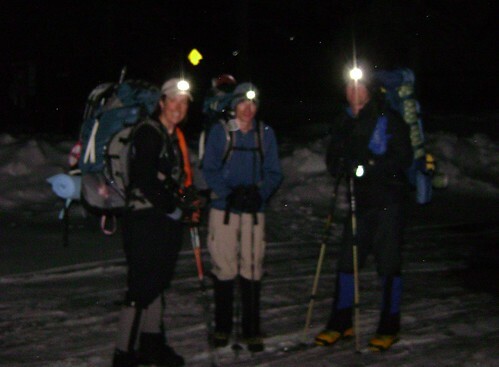 Hikin_Jim wrote: Is it really a problem where we camp when there's 4ft of snow everywhere? 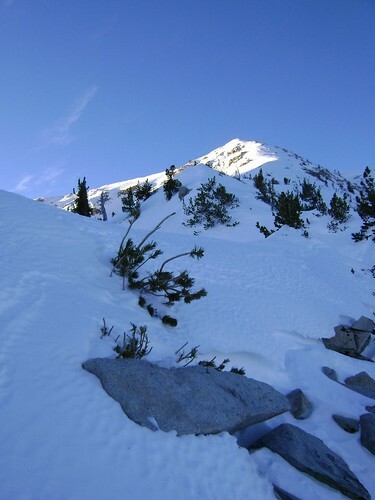 Jim: It probably doesn't have much impact to that fragile area when there's snow on the ground, but if people read about camping there they might think it is okay anytime of the year. There is a camping area just up the hill a short distance from that area, so hiking a little ways more shouldn't be much of a problem for most people even in the snow. 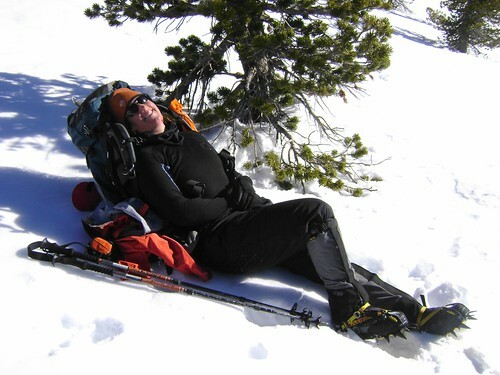 KathyW wrote: Jim: It probably doesn't have much impact to that fragile area when there's snow on the ground, but if people read about camping there they might think it is okay anytime of the year. There is a camping area just up the hill a short distance from that area, so hiking a little ways more shouldn't be much of a problem for most people even in the snow. Ah, yes, good point. Earlier question retracted.